A delicious and healthier version of everyone's favorite, Hamburger Helper! 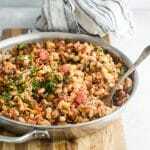 A blend of beef and pork along with some vegetables this macaroni casserole is a hands-down favorite with my kids. In a large pan or deep heavy pot, heat the olive oil and add the diced onion. Cook until soft, 2-3 minutes. Add both types of meat and cook until no longer pink. Drain any grease from the pan and add the pepper, squash, and celery. Mix until well combined. Pour in the broth, tomatoes and tomato sauce and pasta. Mix well and simmer for about 15-20 minutes. Add the cheese and mix through until the cheese has melted. Garnish with parsley and green onions if desired.